R. Murphy Company is an American manufacturer based in Ayer, Massachusetts. The company has been making cutlery in the Boston area since 1906, but have making knives in Massachusetts since 1850. Their line of products includes fishing, carpet and industry specific knives and tools. We find the R. Murphy Clam Knives and Oyster Knives to be the absolute best quality available and we are happy to include them in the Knife Merchant assortment of professional culinary tools. The blades of these Oyster and Clam knives are available in an a variety of types and thicknesses, and we feature only the tope of the line commercial blades. You can't have too strong a blade on an oyster knife. R. Murphy 8 in. 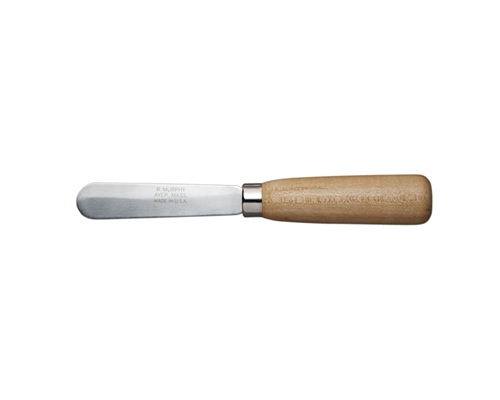 Leather Sheath is ideal for use with produce knives, straight fillet knives and straight boning knives up to 8 in. in length. Actual sheathed dimensions are 8 in. x 1 in. 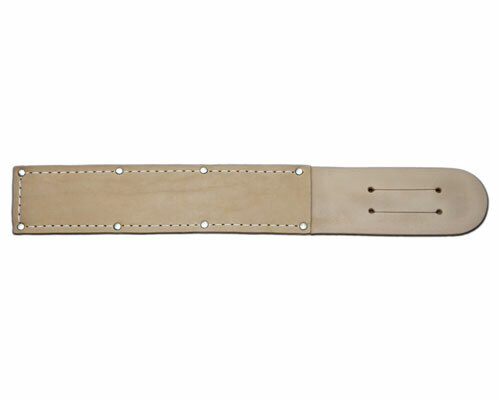 Equipped with belt slots for easy on-hand usage. The R Murphy 4 in. Stainless Steel Produce Knife is used by grocers to quickly trim produce to remove blemishes and to split fruits to demonstrate or evaluate ripeness. The R. Murphy 2 1/8 in. 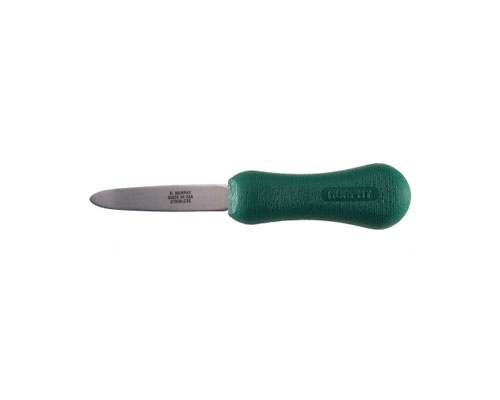 Duxbury Oyster Knife is made with commercial grade (2.4 mm) pointed stainless steel blade with a green polypropylene handle. 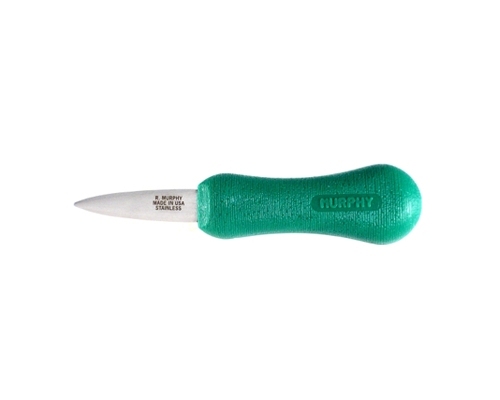 Made in the U.S.A.
R. Murphy Charleston Oyster Knife is a 2 2/8 x 11/16 in. high carbon stainless steel blade with finger guard and Bolivian Rosewood Handle. 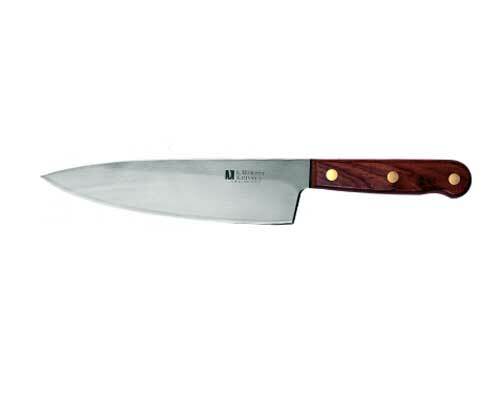 This knife is used for southern USA oysters out of the Gulf Coast. R. Murphy 3 3/4 in. 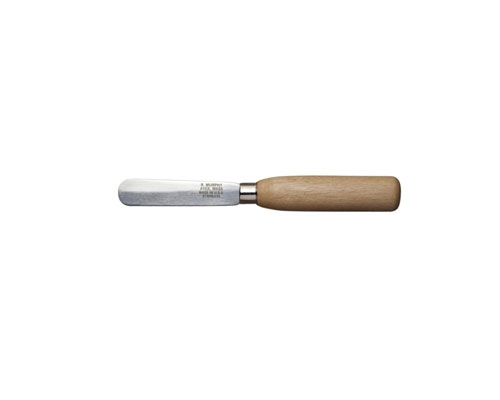 Gulf Oyster Knife is long enough to handle "baker" sized oysters and very strong. Difficult to show in a picture, but this knife is thick in the middle and tapers down to edges sharpened on both sides. Made in the USA. 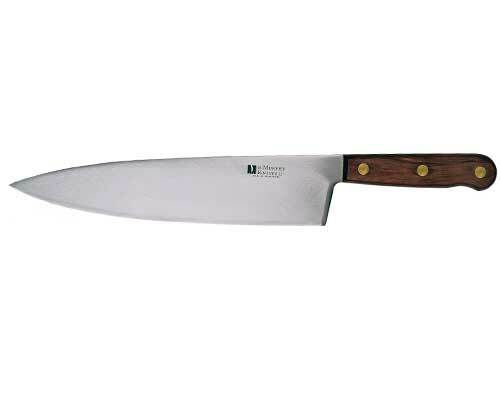 The R. Murphy Damariscotta 2 5/8 in. Oyster Knife is a variation of the WellFleet. The same Bubinga wood resin infused handle, brass riveted to a full tang stainless steel blade. The handle is a little sleeker design and the grip is more comfortable for small to medium hand sizes. The R. Murphy Wellfleet 2 5/8 in. 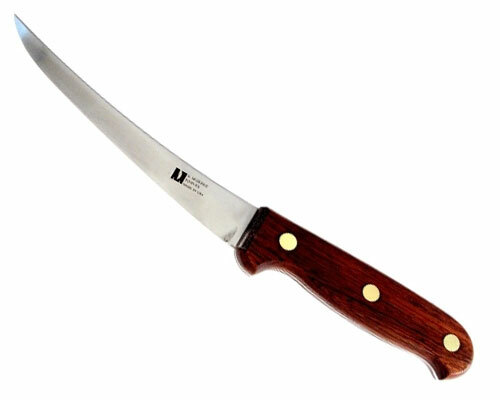 Oyster Knife features a bubinga wood handle that is secured to a full tang stainless steel blade with brass rivets. The wood is vacuum infused with resin to create a tough, waterproof handle. The R. Murphy 3 1/4 in. Large Clam Knife is a stainless steel, commercial blade. 3 1/4 in long by 3/4 in wide with a wooden handle. 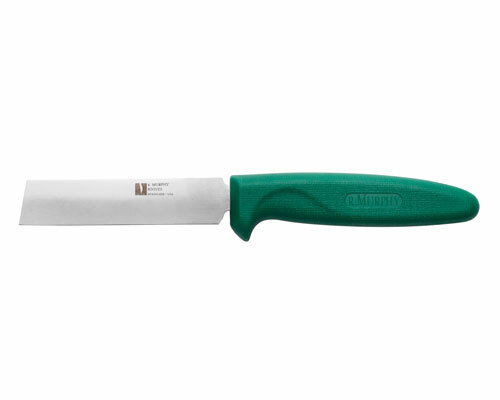 Sharpened on one side only, this knife will tackle any size clam. Made in the U.S.A. The R Murphy New Haven Stainless Steel 2 5/8 in. 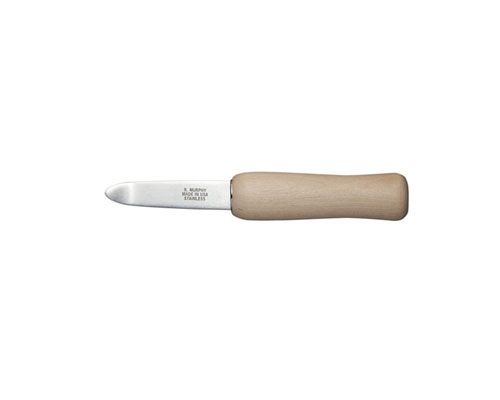 Oyster Knife features a wooden handle. The tip is curved upward to catch the top shell of the oyster and leverage against the bottom for easy opening. 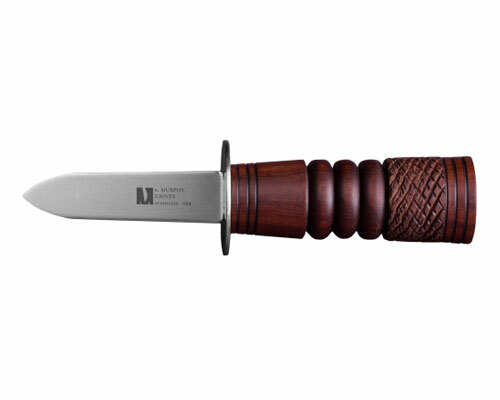 "well crafted, with a simple, comfortable wooden handle that never budged in our hands. It was able to slice oyster muscle without damaging the meat. One shucker noted that it seemed to disappear and become part of your hand." R. Murphy New Haven 2 5/8 in. 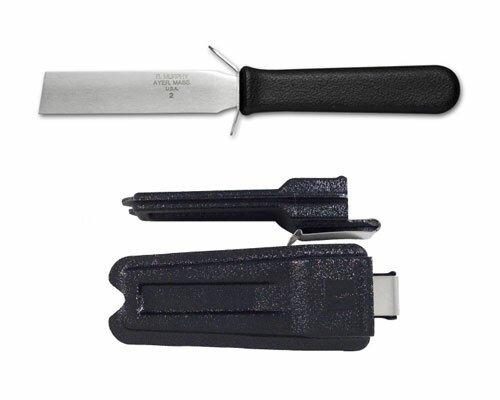 Oyster Knife has a commercial blade which is extra thick for durability. The tip is curved upward to catch the top shell of the oyster and leverage against the bottom for easy opening. 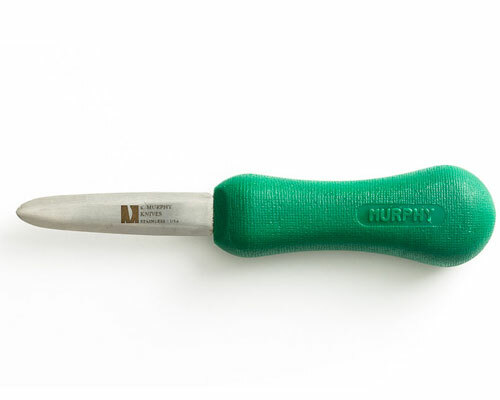 R. Murphy small clam knife features a Stainless Steel blade measuring 2-1/2 x 5/8 inches, sharpened on one side. 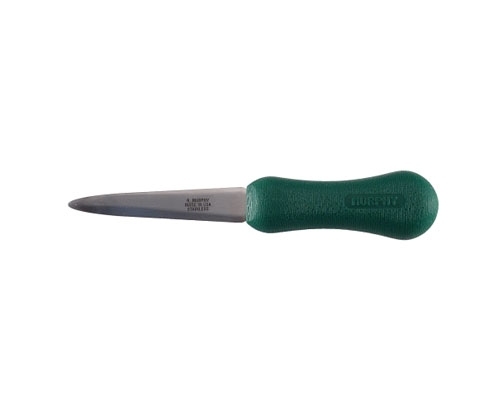 The R. Murphy Commercial Grade Providence Shucker is made out of high carbon stainless steel and features a green polypropylene handle. Made in the U.S.A. The R Murphy 3 in. Stainless Steel Produce Knife is used by grocers to quickly trim produce to remove blemishes and to split fruits to demonstrate or evaluate ripeness. The R Murphy 3 in. 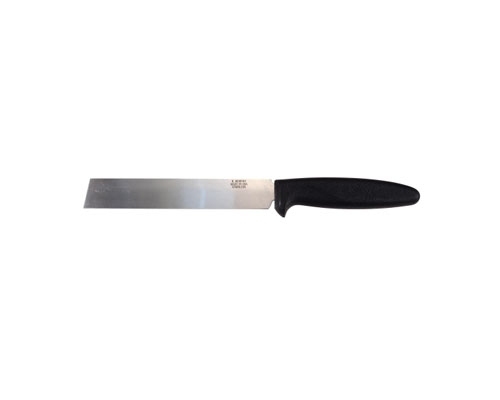 Stainless Steel Produce Knife with Plastic Sheath is used by grocers to quickly trim produce to remove blemishes and to split fruits to demonstrate or evaluate ripeness. The R Murphy 6 in. Stainless Steel Produce Knife is used by grocers to quickly trim produce to remove blemishes and to split fruits to demonstrate or evaluate ripeness. The R. Murphy 6 in. 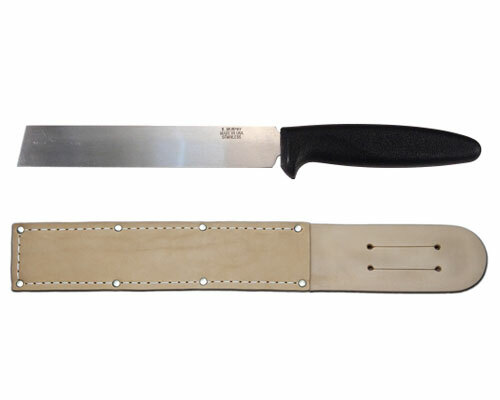 Stainless Steel Produce Knife comes with its own leather sheath. 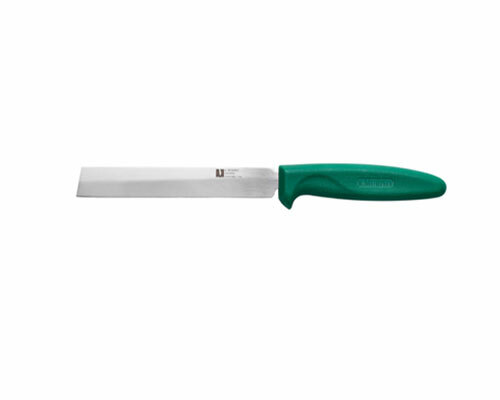 Use this knife to quickly trim produce to remove blemishes and to split fruits to demonstrate or evaluate ripeness. The R. Murphy 6 in. Stiff Curved Carbon Boning Knife is one heavy duty knife. The 1095 Carbon steel used in the blade while it is prone to rust, with its high carbon content, it will hold a superior edge and will save you from constant honing with a steel rod. 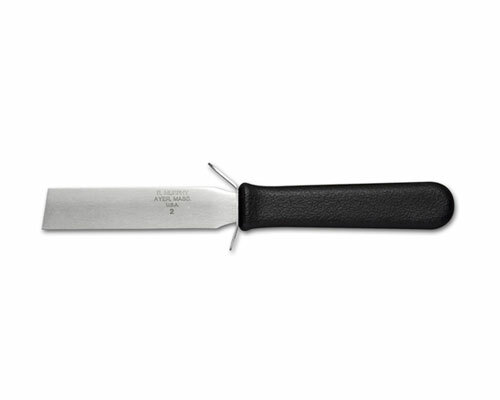 This is a great knife for high volume de-boning work weather its fish, lamb, beef or chickhen the R Murphy carbon boning knife will stand up to the task. The R Murphy Plastic Sheath fits the 3 in. produce and all of the oyster knives. 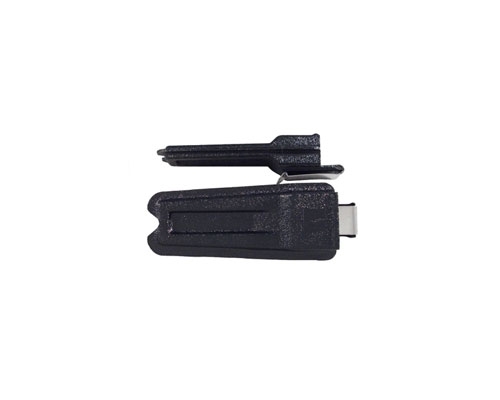 Made of tough, ABS plastic, with a stainless steel belt clip. This dishwasher safe sheath firmly grips the knife. A drain hole in the bottom will keep the inside dry. Made In U.S.A.